My makeshift storage when we travel. The guest room at my parents’ actually has wonderful shelving in the closet that works perfectly! Cloth storage is a very popular topic. There are so many ways to store your fluff and accessories–the possibilities are endless! Many people like to display their cloth because the patterns are pretty, so most of these storage solutions will also work to show off your collection! For those living in a small space, or with limited space to store their cloth collection–there are still many functional and attractive ways to do so. A cart containing my newborn stash. This cart is from IKEA, but Target also sells a similar one. They have 3 shelves and are on wheels. If you are in need of a compact storage solution, or one that is easily moved from room to room–this is a great solution. These canvas drawer organizers from IKEA (Skubb) are great for so many things. They come in a 6 pack of 3 sizes. I love IKEA, if you can’t tell. I probably have half a dozen sets of these drawer organizers. Some are actually in drawers but many are used as baskets or shelving for diaper things. This is my newborn stash contained in a few of them–now I use them for cloth wipes, inserts, and liners. Another great compact storage option is an over the door shoe rack, or a canvas hanging closet shelf. These both maximize vertical space and are a great option for a condo or apartment. If your stash would need 5 of those rolling carts, and you have the space–the following storage options could be great for you! Ah, the spotless nursery before the baby came. If you don’t care about showing off your stash, dresser drawers with organizers could be a good solution for you. I could fit my whole stash in this dresser, but I like it where I can see it! My current storage solution. I love these crates! I found these crates at a home decor center and Amazon. I screwed them into the wall with drywall screws (make sure and find a stud so they don’t fall and hurt someone). I have somewhere in the neighborhood of 120 diapers, and the crates are full. 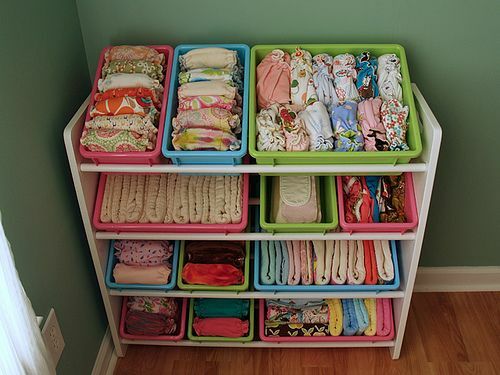 There are those out there with larger stashes, and you could always add more baskets on the dresser top (I like to tip them on end and stack the diapers in them like a shelf). You can put your cloth just about anywhere, but preferably somewhere it can breathe. Don’t shut it in air tight containers or store it in a very moist area (like a bathroom) and you should be good. If you’re looking for long term storage (like storing diapers between children), a pillowcase is a great place to put your diapers. Then you can store in a closet or under a bed–this lets them breathe but protects them from dust and dirt. Tune in next time for Day 8 of Clothmas: Overnight Cloth Diapering!